Paperback, with flaps, 112 pages, 11.8 x 18.7 cm, 4.6 x 7.4 in. "memory loops" – the material of memory is collected in loose loops, circling movements. They often come from a long way off – from the post-war years, from childhood. The words are ambiguous; they have been broken open, blemished until they irritatingly and temptingly begin to shimmer and merge to become the main focus of the book: this is farewell, this is the end of love, this is death. 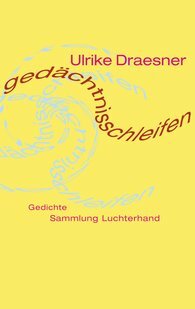 In her volume of poetry, her first book to be published, Ulrike Draesner touches on subjects and a way of working with language that is enormously to influence her later work. Above all, this means the use of modern artificial languages from natural and other sciences. There is a continual search not only for the meanings of the words but also for their ambiguity, for the areas of meanings a word can open up once it has been put in the right context. This volume of poetry allows the reader to understand the poet's unique literary development.